Friday, September the 30th the G. Caporale Institute welcomed a group of Benedictine monks from the Democratic Republic of the Congo. The congregation was attending a training course dispensed by the Sacro Volto di Nostro Signore Gesù Cristo Monastery - Benedictine SIlvestrines Monks - at Giulianova. 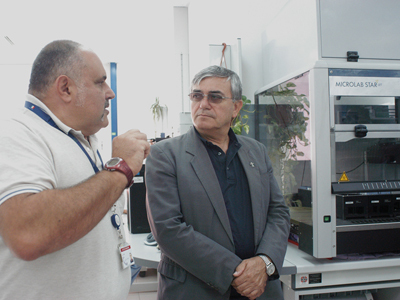 During the visit to the Institute's facilities, the group, which was coordinated by Prior Don Leonardo, had the opportunity to acquaint itself with the Institute's scientific cooperation activities carried out in the south of the world, and meet the men and women working at the Teramo headquarters. The Benedictine group asked the Institute for support in the zootechnical activities which will soon be launched within the Democratic Republic of the Congo mission. These activities, such as the organisation and the management of health and hygiene in a livestock (cattle, sheep and goats) farm, will aim to train local farmers. The G. Caporale has granted its scientific support to the above-mentioned mission by providing its professionals' expertise.